Located a mere 5km from Raglan township this truely magnificent eco-friendly home boosts all modern conveniences of easy living; underfloor heating, fireplace, dishwasher, complete laundry, modern interior, extensive bifold windows and ranchsliders, designed to soak in the views from most rooms. North facing to embrace warmth and sunlight throughout the year, the ambience of this property is hard to find in Raglan. Well planned kitchen, providing tea, coffee and sugar. Dining and lounge area an entertainers delight capturing awe-inspiring views. Enjoy alfresco meals on the deck cooking on webber. This property is designed for the larger family or extended families - not suitable for young children 2-6yrs. Please note twin bedroom can convert to super king bed by pushing 2 beds together therefore accommodating 3 couples plus 2 single guests in separate bedrooms. Please advise property manager of bedding configuration upon enquiry. Raglan Golf Course is located 4 mins drive from property (standing on the deck you can see part of the course in the distance). "Bond Money": this has been put in place should any breakages/damage occur whilst staying at holiday home. Once guests have left an inspection is carried out on same day of departure and bond refunded in 7 days (on the understanding no breakages/damage have occurred). * xmas/New Year minimum of 5 night booking. Hi, as property manager, we pride ourselves in "going the extra mile" to make you stay a memorable one. If you have a special request, please do not hesitate to ask. Landline available for local calls only. Optional at $20/person, please enquire. Please note we do not supply beach towels. Wood supplied during winter months; 1st May - 30th September. Plenty of private parking for up to 4 vehicles. We provide coffee, tea, sugar, salt and pepper plus various spices. Lots of dishes and utensils (well equipped). Public tennis courts are located next to the Raglan Rugby Club in Cross Street (downtown Raglan). Raglan Golf Club, located on Te Hutewai Road (you would have passed enroute to property). A fabulous home for a big group to enjoy. Stunning property, equip with everything you need (and more)! You can’t go passed these views. Wonderful property with amazing views of the beach, township and countryside. The property is very well set up and presented. The kitchen is extremely well set up with plenty of crockery, glasses, serving dishes, everything you could want for your stay.There were plenty of towels supplied for our stay and the beds were very comfortable. Having 2 living areas was great with a large number of people staying there. It is not far from the township and would have no hesitation recommending this property. Would definitely stay here again. Thank you so much for your lovely feedback, we do pride ourselves on "going the extra mile". We would absolutely love to host you and your family at anytime convenient and thank you so much for leaving property in such immaculate condition, always appreciated. 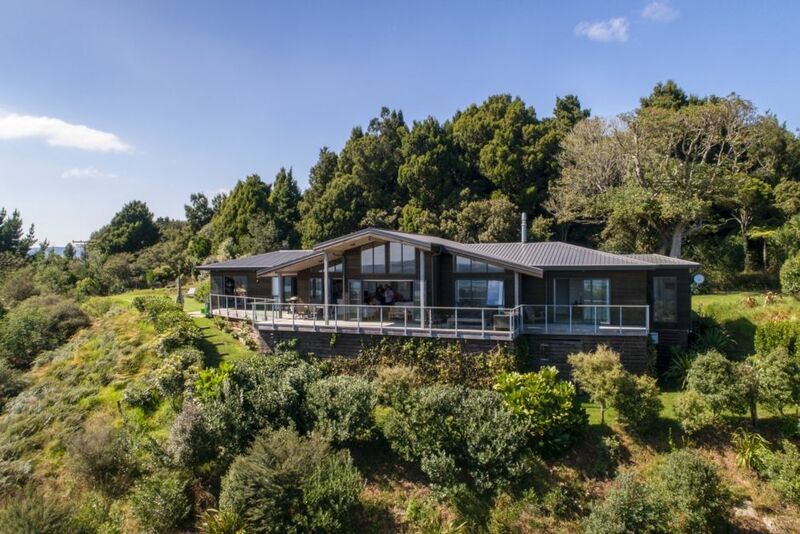 A beautiful home situated in the hills overlooking Raglan. Perched at top of Te Hutewai Road, 5kms from Raglan is this magnificent home.